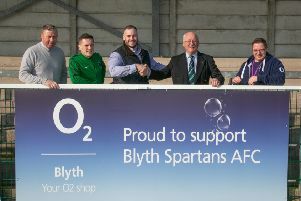 Blyth Spartans manager Tom Wade and coach Lee Picton. Blyth Spartans’ management trio of Tom Wade, Lee Picton and Chris Bell have picked up an unusual, but prestigious, award. They have won the Evo-Stik Premier Division Technical Area prize for their excellent behaviour during games. After every game the referee awards points, up to a maximum of three, which reflect the overall actions and bearing of the manager and his colleagues. Spartans’ staff has averaged around 2.8 over this season. Speaking on behalf of coach Lee Picton and physio Chris Bell, Blyth manager Tom Wade said: “Hearing of this prize came as something of a shock actually! “Football is a passionate game, and sometimes you can get annoyed during a game, but we always try to treat the officials with respect and always shake their hands after a game, whatever has happened. “We try not to shout and bawl at players. Keeping as calm as possible is important and rubs off on the team. “I think this prize goes hand in hand with the Fair Play awards we’ve picked up. Droylsden picked up the prize for the First Division North and Newcastle Town for the First Division South. The award for the winning management teams is a VIP experience at the forthcoming England versus the Netherlands match at Wembley.